Lionel Messi returned to training with Barcelona earlier this week, and worryingly for the La Liga side’s rivals, he was reportedly in the best shape of his career. MARCA, via 101 Great Goals, published several pictures that showed Messi looking much trimmer than usual, and the four-time Ballon D’or winner looked as if he hadn’t been away at all. In the past, Messi has returned to Barcelona’s summer training camp looking a little pudgier, and he has previously admitted that he sometimes divulges in an unhealthy diet. However, these pictures prove that Messi appears to have got his diet completely under control. And with the Spanish Super Cup now just a few weeks away, Barcelona officials have reportedly insisted that Messi is “like a bull,” and he’s due to start for the Champions League holders against Atletico Bilbao in the Super Cup. 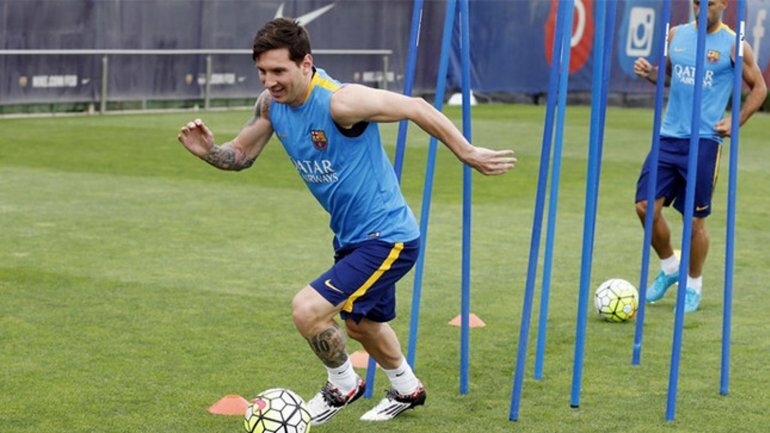 Messi was clearly chomping at the bit to return to Barcelona training too. That’s because, according to the Daily Mail, the Argentinian forward cut his holiday short by four days in order to return. Messi was joined by his national team compatriot Javier Mascherano, both of whom played in the Copa America final just a few short weeks ago. Argentina eventually lost that match to Chile. Messi ventured to the the Ciutat Esportiva Joan Gamper training base on Thursday in order to be fully prepared for the UEFA Super Cup on August 11 against Europa League Winners Sevilla. This match will then be followed the same week with Barcelona’s Spanish Super Cup game against Atletico Bilbao on August 14, with the second leg coming on August 17.